First, we should probably say that rings don’t get smaller over time, but we should also add that weight gain, although a potential factor, isn’t the primary reason for being unable to remove a ring from a finder. As we age, our body changes. We may routinely retain a little more water which settles around the joints, we may develop arthritis which also affects the size and shape of our joints. Also, pregnancy or other conditions can cause joint swelling, as can certain medications. So what to do if you find you need to remove your engagement ring but realize it won’t slide easily – if at all – over your knuckle? Don’t panic about having to have the ring cut off just yet, as we have a number of things for you to try, from the simple to the slightly mechanical. We recommend trying these in the order they are listed here as there are some, albeit minor, risks with the last method. Dehydration can cause swollen joints, as can excessive salt intake. One of the reasons our bodies retain water is because the brain is already aware of having too little of it available, and so starts storing it up. This invariably happens around finger, knee and ankle joints. Drink plenty of water for a day or two and reduce your salt intake. Alternatively, try and keep the hand elevated above heart level for a while, and then put your hand in the iced water for a few minutes. The elevation uses gravity to reduce the fluid around the joint which then helps to reduce swelling, and the iced water also causes the blood vessels to constrict, further reducing swelling almost instantly. 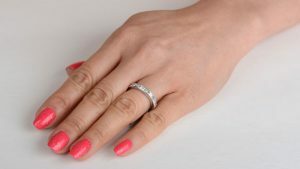 These simple methods are painless and free, and will often be enough to allow the removal of many stuck engagement rings. Many common household products can act as a lubricant to make the removal of a stuck ring much easier. Butter, olive oil, petroleum jelly (Vaseline or similar), soap, lip balm or even window cleaning products such as Windex can help. You are likely to need to wear a latex or other rubber glove so you can grip the lubricated ring easily. Ordinarily, most of these products won’t reduce any swelling that is present, but are an excellent booster for the Easy method above. Alternatively, hemorrhoid cream can be used, and is designed to reduce swelling by its very nature. Similarly, creams and gels which contain anti-inflammatory ingredients are also an option but should be used with caution if you may be susceptible to reactions from such products, or if you have an underlying medical condition that could cause some contra-indications. In all cases, clean hands or gloves are a necessity, as any type of lubricant is prone to attracting dirt, and even small contamination can scratch or otherwise damage the engagement ring. This is a method which first popped up a few years ago, and is surprisingly effective at removing seemingly permanently attached rings. It involves the use of dental floss or ribbon, a little common sense and a few minutes of time. The process itself is very simple. With a length of dental floss or standard ribbon (more is better), simply push the ring as far onto the finger as it will go. Slide one end of the floss under the ring, towards the hand, and then wrap the long end around the finger working towards the fingertip, making sure you start on the ring side of the knuckle you are aiming to get the ring over. The wrapping needs to be moderately tight, as it uses a compression action to physically reduce the circumference of the finger. Take care not to wind the floss so tight that there is a risk of cutting the finger or stopping circulation altogether for an extended period of time. Once you have reached a little way towards the next knuckle along, tie the floss off so the winding can’t loosen. Take the short end of the floss that you threaded under the ring initially, and unwind the floss under the ring itself. As you do so, the ring will be moved slightly further over the knuckle with each unwind, until it can be slid over the remaining dental floss. They say a picture is worth a thousand words, so here’s a video which shows both ribbon and dental floss being used. As you can see, it takes just a minute or two to remove the ring. It is important to work quickly, once you have wound the dental floss or ribbon around your finger, but it’s an excellent and effective way to remove a very stuck engagement ring. Of course, with all these methods, if you have an injury or medical condition which causes pain in the joints of your fingers, you’re probably wise to not pull and tug at your ring to any kind of extent. If it’s a simple case of age or non-painful conditions, however, give it a try before you send for a ring cutter. If all the above fails to work, and the swelling isn’t dangerous, we recommend going to a doctor. If a doctor is unavailable, we advise going to an emergency room. The ER doctors usually have bolt cutters handy and they will be able to remove the ring with ease. It is important to remember that most engagement rings have many small diamonds. These small diamonds are usually held by prongs, and when the bands shifts positions, the prongs will remove their grasp on the stones. Make sure that you check the ring very carefully before you place it into a small bag or container to ensure that there are no diamonds that flew off the ring.